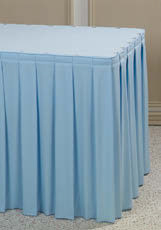 Browse through our large selection of Fabrics, Once you have selected a pattern, be sure to include the product number and color for each item on your order. We do provide the option to order swatches so you know exactly what you are getting. Measure and add all four sides of the table. 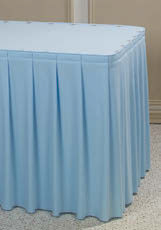 Skirting on 4 sides 30" x 72"
Measure and add three sides of the table together. 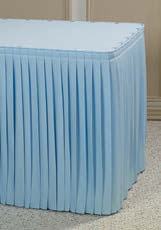 Skirting on 3 sides 30" x 72"
two 6" (15cm) returns for the non-visible side. 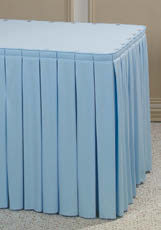 Skirting on 3 sides with 6'(15cm) returns 30" x 72"
Measure the perimeter of the table. NOTE: If your requirements differ, please specify exact sizes on your order. 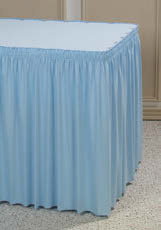 Table skirting is available with either standard slotted webbing or a hook and loop header. Since clips are attached directly to the webbing, standard slotted webbing provides a snug fit around any corner or table shape. Hook and loop headers are recommended for quick set ups and tear downs. Thickness of table edge and type of header will help determine the attachment system. Refer to our Specialty section for additional information. Call us toll free at (800)654-8210 or locate a representative near you to get your order started.